Summary: More than half of banks report that they are unable to combat and keep up with the rapidly changing nature of fraud schemes. Other highlights from a recent fraud survey. If you live in most areas of the country you are still probably adapting to the change to daylight savings last week. 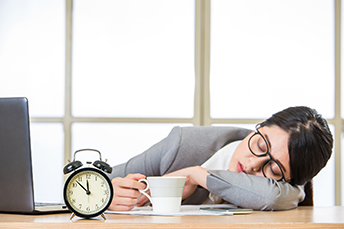 Studies show that even 1 hour of lost sleep can make you hungrier, lower your immunity, decrease your focus at work and even cause more accidents. You may be wondering if the loss of sleep is worth the extra daylight. You will be happy to know that community bankers are definitely not asleep at the wheel when it comes to fraud. That said, sometimes it feels like the more you do, the more fraud increases and the more difficult it is to spot. It is no secret that fraud is on the rise and that the banking industry is constantly struggling to rein it in. According to a recent survey, banks continue to fight fraud on all fronts. We thought we would present some of the highlights so you can see how your battle compares with that of your peers. According to the results of the Vasco Faces of Fraud Survey, 52% of banks admit that they are unable to combat and keep up with the rapidly changing nature of fraud schemes perpetrated against their organizations and their customers. In fact, not only do many banks believe they are ill equipped to combat fraud, only 38% are highly confident that they have top-notch anti-fraud tools and knowledgeable staff to quickly detect fraud. With the high demand for specialized staff these days, along with the increasing cost of fraud prevention, this is not unexpected. When it comes to the amount of fraud that banks are experiencing, 66% have found that the amount of fraud they have dealt with over the past year has risen or stayed the same. Further, 58% say financial losses due to fraud have increased or remained the same. Not surprisingly, 98% intend to increase the amount they spend on anti-fraud measures or to at least keep their current budgets. Training staff, introducing new anti-fraud tools and increasing customer awareness of fraud are among their top priorities on this front. The three biggest areas of weakness banks identified are their inability to keep up with rapidly changing and evolving fraud schemes; the large amount of customer information that criminals are able to easily obtain; and a general lack of awareness regarding basic fraud preventative measures among third party partners and customers. In 2017, 47% of banks experienced credit card and debit card fraud; 42% dealt with phishing scams; 37% dealt with compromised business emails; 31% with ACH/wire fraud; 28% with accounts being taken over; 24% with information being compromised; and 21% with fraud related to new applications. All of this comes at a price, of course. Yet, interestingly, when it comes to their greatest losses due to fraud, 55% of banks say it is not financial losses that are their biggest problem. Instead, it is the lack of productivity due to time-intensive resolution activities. There are numerous efforts made by banks to combat fraud, many of which you are most likely using. Examples include: imposing limits on transactional use (51%); increasing efforts to educate customers (49%); implementing dual authorization through different access devices (38%); relying on manual processes to detect anomalies (27%). These and more are ultimately needed to win this fight against fraud. As fraud is ramping up, so is the idea of a "frictionless customer experience." Here, the survey finds 32% of banks believe that providing a frictionless customer experience is their top priority; 52% view this high level of customer experience as a priority, but not their top priority; and 16% say cybersecurity is the most important thing. Clearly, this balance between the war on fraud and a frictionless customer experience will continue. Allocating resources appropriately and keeping communication open with employees and customers are important no matter how much sleep or lack thereof, you happen to get. The Wall Street Journal reports South Korea prosecutors and police raided three cryptocurrency exchanges after it was uncovered that some customer assets had been transferred to private bank accounts of managers of the exchanges. The names of the exchanges were not released. Meanwhile, in Japan, regulators closed down two cryptocurrency exchanges in action focused on protecting customer assets. In the first of its kind, British bank Barclays has partnered with Coinbase, a major cryptocurrency exchange. Coinbase has 12mm users and with this deal, gets more streamlined convenience in exchanging cryptocurrencies. A survey by the Wall Street Journal of blue chip economists discovers that the group on average projects the federal funds rate will climb to 2.25% by year end vs. 2.17% predicted in January. Higher inflation and a stronger economy were cited for the reasons respondents expected 3 to 4 more rate hikes this year. A survey of millennials by Instamotor finds 24% of working millennials said they got help from their parents with bill-paying.